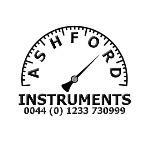 Ashford Instrumentation appointed Nuova Fima UK Agent September 2012. Ashford Instrumentation Ltd are pleased to announce that from the 1st September 2012 we have been appointed the official UK agent for the Italian pressure gauge and mechanical thermometer manufacturer Nuova Fima S.p.a. The Nuova Fima range of products will strengthen our position as a supplier of high quality stainless steel instrumentation into the high end process industry. Full details on Nuova Fima distributors Worlwide can be viewed here. Nuova Fima S.p.a launched their new website in 2013 to showcase their extensive range of pressure and temperature instrumentation for the process industry. 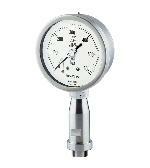 To view this product range please click on this link: Nuova Fima. 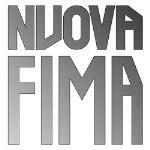 Nuova Fima operate a high tech production facility located near to Invorio in Northern Italy. 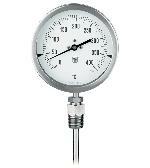 They have been manufacturing Pressure & Temperature Instruments for more than 50 years. Most of the components used in the manufacture of it’s Instruments are produced internally in the Nuova Fima Factory. All raw materials are selected with strategic precision, allowing the production & service standards to operate at a very high level of Quality. Instruments designed for use on power units, pumps, hydro-cleaning machines, presses, engine compressors, turbines, diesel engines, chemical, petrochemical and refrigerating plants and on machines and equipment where pulsating pressures or mechanical vibrations are apparent. They can be used with gaseous or liquid media which do not corrode copper alloy and which do not have high viscosity or do not cristalize. 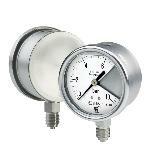 These instruments are designed for chemical, petrochemical industries and for conventional power plants. They are built to resist to the most severe conditions created by the process medium and by the environment and for those fluids, which have high viscosity and do not crystallize. The quality of the materials used to build the sensible element allows their use with high frequency pulsating pressures. The TIG welding between the case and the process socket, strengthens the instrument and assures better containment of dampening fluid. The advantages of filling the case of the instrument with a dampening fluid are: reduced pointer fluctuation, reduced wear of rotating parts of the movement when pulsant vibrations and pulsations occur. Moreover condensation and corrosive atmospheres which could damage the internal parts are prevented. 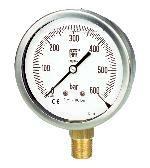 These instruments are built in conformity with the construction and safety specifications of EN 837-1/S3 e ASME B40.1. In case of leaks or break of the elastic element, the operator is protected by a solid separating wall placed on the front of the instrument and by the blow out back. They are usually used in the chemical, petrochemical industries and in conventional and power plants. The TIG welding between the case and the process socket, strengthens the instrument and assures a better tight in case of dampening fluid. The advantages of filling the case of the instrument with a dampening fluid are: reduced pointer fluctuation, reduced wear of rotating parts of the movement when pulsant vibrations and pulsations occur. Moreover condensation and corrosive atmospheres which could damage the internal parts are prevented. In case of leaks or break of the elastic element, the operator is protected by a solid separating wall placed on the front of the instrument and by the blow out back. They are mainly used on high pressure water jet technology like water cutting machines, hydro blasting pumps and turbines, hydrodemolition. The TIG welding between the case and the process socket, strengthens the instrument and assures a better tight in case of dampening fluid. The advantages of filling the case of the instrument with a dampening fluid are: reduced pointer fluctuation, reduced wear of rotating parts of the movement when pulsant vibrations and pulsations occur. Moreover condensation and corrosive atmospheres which could damage the internal parts are prevented. 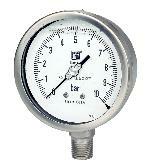 These instruments are built in conformity with the construction and safety specifications of ASME B40.1. In case of leaks or break of the elastic element the operator is protected by a stainless steel safety cell solid front and by the blow-out back. They are usually used in the chemical, petrochemical industries and in conventional power plants. The TIG welding between the safety cell and the process socket strengthens the instrument and assures a better tight in case of dampening fluid The advantages of filling the case of the instrument with a dampening fluid are: reduced pointer fluctuation, reduced wear of rotating parts of the movement when pulsant vibrations and pulsations occur. Moreover condensation and corrosive atmospheres which could damage the internal parts. Alarm contacts are accessories with movable contacts in air, which open or close electric circuits depending of the position of the indicating pointer. 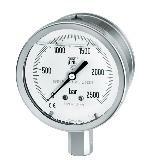 They are used with Bourdon tube pressure gauges, bellows, diaphragm and thermometers of NUOVA FIMA production, in such way they become pressure and temperature switches: the optimal and sure solution to automatize any kind of equipment. 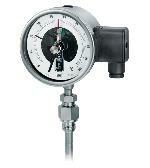 These instruments are designed for use in chemical, petrolchemical processing industries. They are built to resist the most severe operating conditions created by the ambient environment and the process medium. An TIG welded case/bulb strengthens the whole construction. 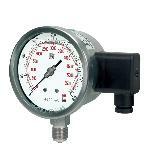 A leak tight fit is ensured if the instrument is filled with a dampening fluid to prevent damage due to vibration. These instruments are designed for use in chemical and petrochemical processing industries, and in conventional power plants. They are built to resist the most severe operating conditions created by the ambient environment and the process medium. An TIG welded case/bulb and capillary strengthens the whole construction. 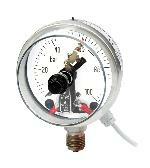 A leak tight fit is ensured if the instrument is filled with a dampening fluid to prevent damage due to vibration. They are used to control the electrical operation of compressors, pumps, presses, hydraulic and pneumatics equipment, chemical and petrochemical plant. The contacts open or close the circuit depending on the position of the indicating pointer and they are adjustable over the whole range. The filling drastically reduces the effect of such factors as well as those caused by a corrosive atmosphere, giving longer life and better performances of the pressure gauge and their electric contacts. 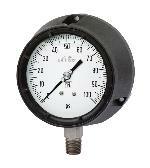 They are also available with inductive contacts intrinsecally safe. ✔ Double elastic element: Bourdon tube and electronic sensor. ✔ Vibrations and pulsations proof. ✔ EMC immunity: as per EN 61326.
or click here and complete your contact details.